2014 - Page 3 of 21 - Marketing & Brand Strategy. Steve Poppe, Founder. Facebook’s monetization model is a lot like TV’s, but without the professional content. It is a content sharing platform the lion’s share of which is consumer-generated — friends sharing with friends and acquaintances. It’s not professionally created and that’s the allure. Like TV, Facebook makes money selling ads, interspersed with the content. When Facebook was young we had no other way to keep in touch with lots of far-flung friends; today we have many ways, lots of apps. And let’s face it, the content on Facebook is not that great. Add to the equation the fact that marketers are spamming us on Facebook and the pool becomes even more brackish. Facebook encourages marketers to be more meaningful and stimulating with their content while it continues to fine-tune the algorithm and targeting hoping to create greater ad investment returns. It is not going to delay the wear out factor and Facebook knows it. They will have to amp up the quality of content so look for them to start investing in original content creation. It won’t be like Amazon or Netflix originals…it will be more interactive and communal. But it’s coming. I wouldn’t be surprised if its sole sponsored to begin with. Stay tuned. Peace. More and more in my brand planning practice I hear myself talking about data as a brand asset. Or at least a brand opportunity. In K12 education, data-driven assessment is a big driver of improved teaching and learning. In healthcare, measuring outcomes and return-to-function and tying those measures to treatment protocols is a big driver of the improvement goals of the Affordable Care Act. And in marketing itself, there are few discussions about expenditures and tactics that don’t include reference to ROI data. Many recommendations I make to companies these days include hiring a data nerd –even if only a part-timer. Outbound, data is proof. (Readers know my brand planning mantra of “claim and proof.”) But inbound data is all about operations. Performance. Ideation. And creativity. We are in a data driven world, we marketers. Data is no longer the provenance of analysts; it is for, and about, everybody. You needn’t make data your friend but you should certainly become acquainted with it, embrace it and use a healthy dose in your day job. Peace. The Launching Pad for Marketing Buildables. So with an eye on the buildable, I go to work. On a brief. Most pop advertising and marketing theory today suggests using a short brief. Not me. I like to go all Medium.com on the brand strategy. The idea from the brief is short and focused, yet the journey to the idea is rich. Yesterday I presented a two word brand idea. Can you imagine? 20 +interviews, thousands of words and stories in the strategy stock pot, lots of IP and category learning over the years and a 2 word brand strategy? (It was supported by 3 planks and lots of proof.) Audacious? Hardly. It fit. It organized. It created a launching pad for buildables. Peace. I ask a lot of questions. It’s the trait of a brand planner. Questions are always about learning but when all is said and done they resolve into one of two types of strategy: optimistic or pessimistic. Back in the day working in the tech sector there was an acronym FUD which stood for Fear, Uncertainty and Doubt. It drove strategy for IBM and lots of other tech companies selling hard- and software. Pessimism. I’m no Maslow but I think it’s safe to say brand planners who spend time in positive land are more apt to garner favor and loyalty with consumers then are their negative-focused counterpart. So wash your hands and go be positive. Peace (not war). Stim and the Internal Creative Department. I was director of marketing at a company with a fairly substantial in-house creative group. We had an animator, two web developers, an application nerd, copywriter, junior art director and creative dept. manager who was a designer by trade. Until I had written the brand brief we just chugged along doing project work, one-offs as had been done before my arrival. Nothing big was to be worked on until the brand brief was finished. I briefed the in-house team once we were ready and asked them to start off by cracking the code on an ad campaign – thinking that was an easy way to get some ideas. Who doesn’t know how to make ads? With the right brief and a strong strategic idea, the team should be ready to nail it…and nail it quickly. Ooofahhh. What a mistaken expectation that was! They were like deer in headlights. Apparently they’d never seen a brief before. They may have understood what a campaign was but couldn’t wrap their heads around a brand strategy. I guess not every place labeled “creative” can do agency work. “Let’s get out of the building,” I said. Let’s go watch sellers sell and buyers buy. Let’s hear consumer language, let’s share and talk and play act. The creative dept. manager, looked at me like a dog looks at you when you put the ball behind your back. Out of the building? A few plants, a ping-pong table, a title or two, and some fun lampshades do not a creative team make. Peace. UCONN. All proof no idea. Investing $3.6 billion to create breakthrough in areas such as additive manufacturing, genomic medicine, and cybersecurity. Hiring 300 faculty who will advance the fields of cognitive science and creativity, pursue scholarship in law and human rights, and develop new areas of intellectual property. Recruiting 6,500 additional students who will lead their generation in addressing the most important challenges of our time: sustainability, global heath, and social justice. How can you argue that UCONN is doing smart, cool stuff? You can’t. But the ad headline “Dear UCON, Thank you. Sincerely, The Future.”, dropped out of a blue background of celestial stars and universe laid an egg. The tagline “Innovation. Unleashed.” didn’t help. This ad falls under the great proof, no idea category. And any glimmer of an idea (Reports from the future?) was hidden behind lazy execution. No brand planner watching over this work. Brand planners find the proof. Array the proof. Demonstrate the proof. They seed the idea and educate practitioners. Bad advertising agents and clients ask for the proof to be put in a big old bucket and tossed hither and thither. Peace. Yesterday I had two meetings that excited the heck out of me. The first one was in NYC with a geotechnical and foundational engineering firm nobody knows. Okay, maybe 10,000 people know them. The office looks like any other: water coolers, file cabinets, a library, cubicles, some offices, an oversized printer. Young men and women tread the halls with folders and laptops in hand. You might think your were at Razorfish or JWT. What is cool about the place is that this firm is the premier engineering firm for what goes below ground to undergird huge building structures like the new Freedom Tower. There’s very little they don’t know about soil, pressure, rock and water. If you are taking a building down and you are afraid the neighbor’s building might be compromised, these guys are your first call. With over 100 year history in NYC, their foundations are keeping the city standing upright. To walk through the offices? Just a bunch of smart people. My other meeting was with a healthcare company that is changing the way healthcare is ministered. The current model of healthcare is to pay physician to treat the sick. This group is paid to keep patients healthy. Before you get diabetes, this group of physicians wants to catch it. Before your grandma falls and breaks her hip, this group wants to remove the loose rugs. Walk through their office and you’ll see PCs, coffee machines, cubicles and other nondescript equipment. Just a bunch of smart people. Saving lives. The first company was a hundred plus years old, the second about 4. One company is rock steady, the other fluid and evolving. Both have strong leadership, good culture and serve markets with pend up demand. There is an amazing amount of good in the commercial world, you just have to pay close attention. Peace! I have often wondered how difficult it must be to go work in a country with a different culture and language and do brand planning. I worked with a smart 20-something planner at JWT-NY who picked up and moved to Shanghai. Daring. I follow a really smart Brit planner who works at Wieden+Kennedy Shanghai. He’s killing it. How do they communicate? How do they feel? How to they see patterns and interpolate? In an ideation session last week with some brand planning colleagues, all of whom had done customer interviews for a specific B2B client, we established some guard rails, talked about buying logic, purchase station, recited stories and delved into emotion. It wasn’t until this morning, however, that I realized what was missing. Language. We were speaking in marketing-ese. I was with smart people with great marko-babble radar, but we were missing the cues that come from natural business language. In B2B it’s important to know the language that cues the target to really listen. That gives them permission to listen. That is what was missing. That’s what must happen next. Peace. There is a new tech writer gaining momentum. His name is Farhad Manjoo and he writes the “State Of The Art” column in The New York Times. Read him, you will get smarter. Since the half-funny, very good tech analyst David Poque left the confines of the Times for Yahoo, I’ve been seeking a Walter Mossberg-like writer at the Times. Mr. Manjoo may be it. He’s bold, thoughtful, not averse to homework and understands the tech user. Great writers are prescient when it comes to trends and usability, so let’s see if he can keep it up. His column today was about Amazon. And that’s the second thing. Everybody knows Jeff Bezos is a tech top dog. Amazon’s journey has been fun to watch. Unlike Microsoft, whose cash cow(s) allowed it to buy and launch a number of public duds, Mr. Bezos has launched a luncheonette’s worth of products with varying degrees of success. From books to retail to devises to video and shipping, Amazon touches more consumers in more ways than most brands. Add to that Mr. Bezos move into publishing and one can assume the data he retrieves and the behaviors he notes are preparation for other very interesting plays. But unlike Microsoft, Amazon doesn’t get dinged in the press and among tech elites. The difference between Amazon and Microsoft is that Microsoft pizzled away money on new endeavors but always kept a huge bank — Amazon on the other hand continues to lack any meaningful profit. As a brand planner, Amazon confounds me. As a consumer and business dude I really like them. For a first-to-market company, they do a lot of second-to-market things. Messrs. Manjoo and Bezos are players. And both are going to be exciting to watch. Peace. 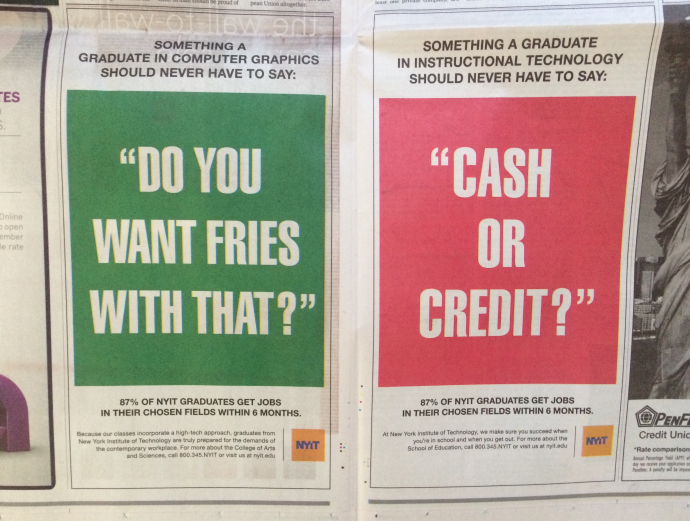 NYIT is running a new print campaign encouraging people to get into the hi-tech fields. A worthy undertaking indeed. The U.S. is falling behind the world when it comes to educating students in science, technology, engineering and math (STEM). Especially women. So reminding students what lies ahead at colleges and universities that provide these programs is a good idea. Making fun of — no, insulting — people who work in retail, however, is not the way to do it. Not cool. NYIT has used just such a ploy in its latest ads. The largest company in the world is Wal-Mart. NYIT makes fun of them. One of the most powerful brands on the planet is McDonald’s? NYIT makes fun of them. Not by name, by association. But more than just tweaking companies whose riches abound, NYIT makes fun of their employees. And that’s two clicks from vile. Fun is fun. A joke is a joke. Belittling hard workings employees in the retail business…not something a well-educated institution should be doing. Peace.